When Wily Coyote falls victim to his own weaponry, he is reduced to a skeleton. But what would his skeletal remains really look like? South Korean artist Hyungkoo Lee uses the techniques of paleontologists to create the skeletons of cartoon characters. (Click on the numbers on his site to see the different characters). Google's street view caught a house on fire! You can drive around and see angles. Fire trucks, people watching. Google removed one view but the rest remain. They also caught a car fire. These are all very un-funny to someone but they illustrate that before long, everyone and everything will be on Candid Camera. Website will antique a photograph in seconds. Wanokoto Labs, via Lifehacker. I am not sure if he knew, but this is not just "a sports photographer," this is Vince LaForet. You have seen his work — check out his art prints. I’ve got to confess something: I slept through my first Olympic assignment yesterday. Yep IT happened. I got done completing my first blog at 6 a.m. on Saturday morning - after a day that had lasted 22 hours. I knew I was in bad shape as soon as my head hit the pillow, because my wake-up call was set for 7 a.m… I never heard the alarm go off. Yipe! Not sure I would have admitted that. But he's a seasoned pro. It’s been ridiculously difficult to access my e-mail let alone my blog (or any blog for that matter) in China - they’re all blocked. Particularly in my hotel it seems. Every VPN I set up works for a day and then gets blocked - same goes for utilities that I download to work with my web browser(s). I’m convinced that there’s some Chinese ISP technician (or worse the Chinese Gov’t) that I’m playing an endless game of Whac-A-Mole with - and I’m on the receiving end and losing! So I apologize for not getting back to many of your comments. I’ll keep trying to figure out a way - or at least to stay ahead. I am reading every single one of your comments as they come to me as e-mail - and BIG thanks for the encouragement, and kind words. Keeps me going… when I get a chance to both connect and have a little time - I’ll fire off some responses. So keep them coming - they’re not going unnoticed! I’ll never take my “internet freedom” for granted again. Google Maps has added walking directions. They already had public transit in some areas. They include a lot of helpful information, in addition to the router. For instance, I can drive the 3.5 miles from work to home in 8 minutes. On foot, the route is quite different but the distance is that same. Google thinks it would take 1 hour, 11 minutes (obviously, they don't take into account any ice cream stores en route). By bus, they tell me it will take 58 minutes — and cost $1.75. They also tell me it would be $2.05 to drive. Again, no ice cream is factored in. Nicely done. Though it's in beta, the walking route matches what I would choose. I love the fact that Google keeps improving their systems. By the way, if you didn't know — one of the coolest features of Google maps is that you can click and drag to change a route. If their directions send you up 101 but you prefer to take 280, drag the route line over to 280 and a new route will be drawn, using the points you request. This is too cool. The "Tilted Twister" is a robot, built from Legos, that solves Rubik's cube, with no external PC. It was built with standard Lego Mindstorms NXT kit. More info on the Tilted Twister page to the video. From: Tilted Twister, via Hackzine. When the Mercury-News laid off much of its staff recently, we lost the reporting of food editor Carolyn Jung. I loved her articles because she always went the extra mile. She reported not just on the food and the recipes, she would find out where it is available and interview local chefs on how they use it. I especially remember an article on fresh garbanzo beans (who knew?). Happily, Carolyn resurfaced quickly as FoodGal, where she has been posting an article every day or two with her "musings on food, wine, laughter, and life." This is very cool. 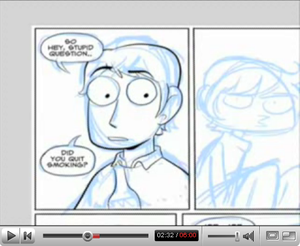 Alt comic artist Meredith Gran posted a timelapse video of the creation of her comic, Octopus Pie. Hypnotic and revealing of the artist's process, this shows four hours of drawing in a few minutes. Way cool.